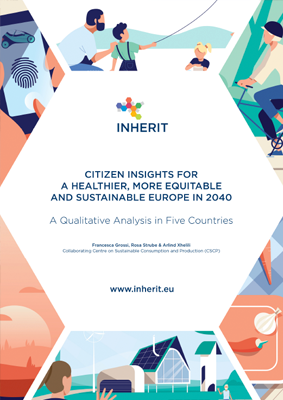 The INHERIT focus group report analyses European citizens’ perceptions towards future positive scenarios. ‘My life between realities’, ‘Less is more to me’, ‘One for all, all for one’, ‘Our circular community’ depict four different narratives of reaching healthier, more equitable and sustainable societies. It uncovers citizens’ behavioural determinants (capabilities, motivation and opportunities) corresponding to their stated preferences and attitudes in four main lifestyle areas, namely green spaces, energy efficient housing, active mobility and consumption of food and beverages. From the four future scenarios, ‘My life between realities’ was deemed the most controversial among citizens, mainly due to its prominent technological attributes and influence. The increased share of green spaces and their contribution to more relaxed, calm and healthier living patterns drove citizens’ preference for the ‘Less is more to me’ scenario. The most appealing scenario, according to European citizens, was the ‘One for all, all for one’ scenario, mainly due to its elevated focus on communality, locality and human mutual support. Lastly, ‘Our circular community’ was also found appealing because of the citizens’ inclusion in socio-economic affairs and the promotion of resource efficient models of production and consumption. To explore the European citizens’ views in more detail take a look at the full report.